Part FIVE of our "District 4 Head-to-Head Tour," which seeks to interview all eight candidates running in a special election to replace Councilmember Marilyn Praisner, who passed away in February. A primary will be held April 15, followed by a general election May 13. County Council candidate Pat Ryan at the Parkway Deli in Silver Spring. (Picture forthcoming!) For more information about his platform and biography, check out Ryan's campaign website. "I'm not the favorite," he says. "Don Praisner is running. The widower." The widower. Those two words have cast a cloud over the District 4 special election, being held to find a replacement for Councilmember Marilyn Praisner, who passed away in February. And while her husband Don is running to "carry on her legacy" in the council, it's Ryan that former JUTP guest blogger Adam Pagnucco says "may be the true heir to Marilyn Praisner from a policy perspective." Pragmatic but deeply concerned about the glacial pace of progress in East County, the Fairland resident and local activist has thrown his hat into the ring to see that old promises are not broken. "I'd been interested in running for local office for a long time," says Ryan. "I thought it was really important for someone with a lot of local connections and really understood the district [to run]." It doesn't help, though, that no one outside of the immediate area seems to know where he lives. "Yeah, I get a lot of blank stares . . . I say 'it's on the way to Columbia'." 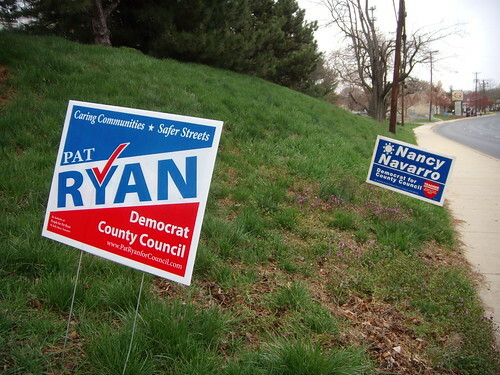 A Pat Ryan campaign sign vies for visibility along Randolph Road in Colesville. Since moving to the area in 1984, Ryan became intimately involved in the community. A firm believer in public education, he sent his three children to Montgomery County schools through eighth grade, when they transferred to a private school at the request of his wife. During and after his kids attended County schools, he played a role in the creation of the Northeast Consortium, which for the past ten years has given East County eighth-graders the opportunity to pick from three local high schools based on their individual "signature programs." "We were in this multicluster PTA meeting and I said 'Why don't we let parents and students choose which high school they want to attend,' and they said 'No, we don't do that in Montgomery County'," says Ryan. 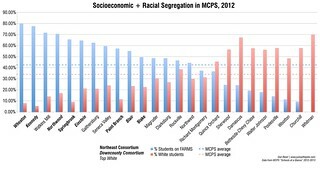 "One thing I saw that we don't talk about is white parents' fear of black students going to school with their kids . . . . Sherwood parents afraid of their kids going to Springbrook. "I talked to a lot of parents ten years ago who said they moved Olney because it's a predominantly-white area and they wanted their kids to go to school with white kids," he adds. "In a way, proposing the [Choice Program] was a way to avoid dealing with that conflict" faced by parents anxious about the presence of minorities in East County high schools, Ryan suggests. However, he stressed the significance of exposing students to a range of different cultures and experiences while in school. "What's the value here?" he asks. "Is it more important to give everybody their first choice or to give everyone a racially and economically diverse student body?" "In a county that's increasingly diverse," he adds, "you have to make sure you're not tolerating a silent racism." Through working with Action In Montgomery, a County-based "multi-racial, multi-faith, strictly non-partisan" group devoted to encouraging civic involvement, Ryan has become very passionate about the issue of affordable housing, making it a central part of his campaign. "I just thought it was important that the kind of issues we've been working on were heard in this race," he says. Affordable housing isn't just about giving people a roof over their heads, explains Ryan. "I think locating housing closer to where people work deals with a lot of issues," he says. "There seems to be a lack of active visioning about how to solve this problem because people are commuting from Howard County and Frederick County to here, we have more traffic, more greenhouse gases." As a result, Ryan has put together a five-point plan for dealing with affordable housing, which he explains in detail on his campaign website. One of the most dramatic improvements he proposes is that the County create a Non-Profit Corporation to build low-income housing using private funds. Montgomery County lacks the necessary impetus to improve their affordable housing stock, especially when compared to the effort it puts into more lucrative ventures, he explains. "The reason Downtown Silver Spring got developed the way it did was because somebody was pushing for it in the County Executive's office, and we need someone to do that for affordable housing," he says. 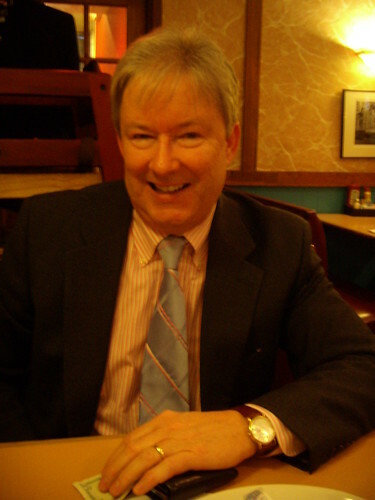 Ryan's involvement in planning and land issues began in 1997, when he served as a member of the Fairland Master Plan Advisory Committee, which guided the creation of the Planning Department's master plan for the Route 29 corridor north of White Oak. On the committee, he says, "You sort of see how a community gets shaped, how important values get protected . . . who shapes the future." However, in the eleven years since its adoption, the master plan has not been fully realized. "There's a lot that hasn't happened," says Ryan. "The Burtonsville Town Center concept is still in planning. For God's sakes, it's ten years since the plan was adopted." With Howard and Prince George's counties bordering the planning area on two sides and a major highway bisecting it, developing a cohesive community has proved difficult. Forty years ago, Montgomery and Prince George's collaborated on the bi-county Fairland-Beltsville Plan, but it was replaced by master plans covering each side of the county line later on. "I think development which crosses the [county] line doesn't have a good track record," Ryan says. There doesn't seem to be a shared vision between them." One example of how the two counties haven't been communicating with each other is Cherry Hill Road, which has been five lanes on the Montgomery side for nearly ten years but is only now being widened from two lanes on the Prince George's side. "If you drive down that way at any time of day traffic is just dangerous," laments Ryan. "The history of Montgomery County and Prince George's in terms of planning road capacity is not encouraging." "I think there is this sort of sense that Prince George's County figures whenever they work with Montgomery County they'll get the short end of the stick," Ryan says, stressing why inter-county cooperation is so important. "The future of our area is intertwined with theirs . . . Don Praisner lives in Calverton, and Calverton is half in P.G., but the issues are the same. You look at traffic, you look at crime, you look at amenities, all of the issues that affect a community, and they all overlap." "You don't solve traffic as Montgomery County. You're putting Band-Aids on a local problem," he continues. "Traffic is regional. It involves Frederick County and Prince George's County and even Northern Virginia . . . we need to get together and do more active planning . . . if we're gonna do something, we've gotta start now." In the future, Ryan says, he'd like East County residents to consider "how we can share development space in a way that will lessen dependence on the car," he says. "Everyone in the Fairland area has a car. I know you don't." "I do," I reply. "I drove here." "But you look at some areas like the new Rockville Town Square where housing and shopping are in spaces where people can walk to them, that's the kind of development I'd like to see," he continues. "White Oak Shopping Center, that's probably going to be redeveloped. What do people want to see there? What's gonna happen?" Hey Dan - you interviewed Kanstoroom in Rockville, Hardman in the Wheaton CBD and now Ryan at Parkway Deli near Downtown Silver Spring. What are all these guys doing outside the district? I hope they are campaigning inside the district lines! Adam, Wheaton Central Business District is just barely outside of the bounds of District 4, and I assure you that what happens in Wheaton CBD affects nearby District 4 residents. In any case, while District Council representatives aren't At-Large representatives, we do vote on issues that affect the whole county. It's narrow-minded to think that we can concern ourselves only with our districts. It's just that a district is about as large an area as even lifelong residents such as Mr Ryan or myself can know well.. We could have met at Starbuck's in the Del Mercado shopping center, but I happen to know that Dan has an interest in Urban Planning and in "urban core revitalization" and there's a lot of that going on in Wheaton. There's a lot of that going on in Silver Spring, too, of course. Wait, so someone whose kids went to private high schools is running on a platform of busing kids to schools to "create an economically diverse student body" while implying that white parents in the county are secretly racist? That will no doubt go over well. Also, can anyone actually provide some sort of census data or something equivalent that shows who is commuting from what ZIP code to what ZIP code and their household income? In my experience, a large number of the people who commute from Howard County or elsewhere do so as a lifestyle choice, not out of economic necessity. They want a large house than they might be able to afford nearby. Plenty of the McMansions being built on farmland in HoCo are occupied by people who work in DC & Montgomery County. They have a decent salary but choose to live far away from their jobs - it's not that many couldn't live closer if they wanted to. Sure, there are plenty of people who do so for valid economic reasons, but if you look at the cars coming down 29 each morning, it's not a stream of jalopies à la The Grapes of Wrath. There are plenty of Mercedes and H2s mixed in. Wikipedia has an excellent reference on Transportation in DC which of course has lots of reference links including Census. According to census data, 10% of HoCo residents commute to somewhere in Montgomery County. Of course, this data is approaching 10 years old. Now, it also says almost 10% of Montgomery County residents work in Virginia. Apparently Virginia needs to provide us with low income housing! Ryan gives lip service to fiscal restraint and faint criticism to employee contracts, but if on the council he would not cut the budget and would vote or override the charter property tax limit. We already have 8 people like that on the council. We don't need another guy who gets great job out of spending the hard-earned money of others in a recession. Kanstoroom is just as smart and as compassionate as Ryan the social engineer and is more frugal. If this isn't a vote your pocketbook year, when will we have one? Basically since Montgomery doesn't have the same quality of Jobs as Northern Virginia which leads to more Montgomery County(along with other nearby Counties in Maryland) Residence/Tax Payers to make LONG COMMUTES to Virginia in order to accomplish their career goals and help pay their Sky Rocketing housing/tax fees in Maryland. Anonymous appears to be posting from somewhere in the State of "altered". Montgomery has more jobs than it has homes, and so many of them are top-dollar that they can't build oversized homes fast enough to house all of the bankers, doctors, scientists, and businessmen of all kinds. We don't have a jobs shortage -- yet. A lot of people cross the bridge to Virginia because of the type of work they do. Keep in mind, wherever they work, they pay taxes in Maryland. Virginia has an immense Internet/IT job market, mostly because that's where most of the major internet backbones come together. There's a little closet in the basement of a parking garage where it all started, and that little parking garage chock full o' internet backbone is now surrounded by buildings full of internet and information workers. Montgomery hasn't got that, not so much, but we do have NIH and the biotech industry we have here in Maryland is as big or bigger than Virginia's IT industry. For every two web techs commuting south into Virginia, there's a scientist or researcher in biotech commuting north into Maryland. 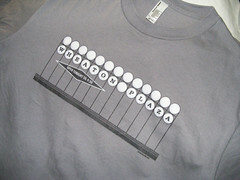 By the way, Anonymous... have you been into Bethesda/Chevy Chase or Silver Spring recently? I guess not. What has Virginia got to compare with that? Crystal City? Feh. "By the way, Anonymous... have you been into Bethesda/Chevy Chase or Silver Spring recently? I guess not. What has Virginia got to compare with that? Crystal City? Feh." Talking with Pat Ryan is like inviting a monstrous tax increase into your home.